TI is the approved and tested vendor of power solutions for the Altera® FPGAs and CPLDs. TI works closely with Altera to recommend the best power management solutions for a wide variety of applications, such as embedded memory, digital signal processing (DSP) blocks, high-speed transceivers, or high-speed I/O pins. TI can recommend product solutions for the following Altera FPGA series: Stratix®, Cyclone®, Arria®, and MAX®. WEBENCH Power Architect suggests devices that meet the basic supply voltage and current requirements of the FPGA. 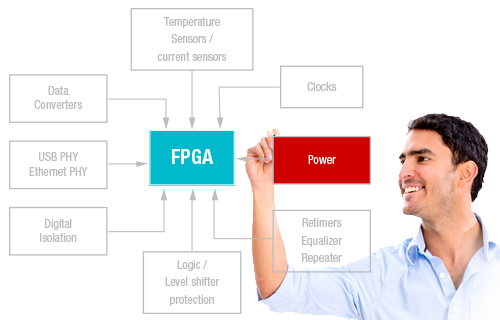 Before picking devices for your design, refer to the FPGA datasheet for more detailed power supply requirements that must be met, such as voltage tolerances, power-up/down sequencing, AVS/DVS, and ramp times. ** Loads are grouped by output voltage and sequencing order. † Linear LDO regulators dissipate power proportional to the voltage drop from input to output. Reduce LDO voltage drop and power dissipation by powering LDOs from an intermediate rail voltage that is closer to the LDO output voltage.